FSSA vocal student Nina Martin-Jenkins wearing the branded clothing she helped create. Fashion is no longer just about matching a light blue shirt with some washed out mom jeans. 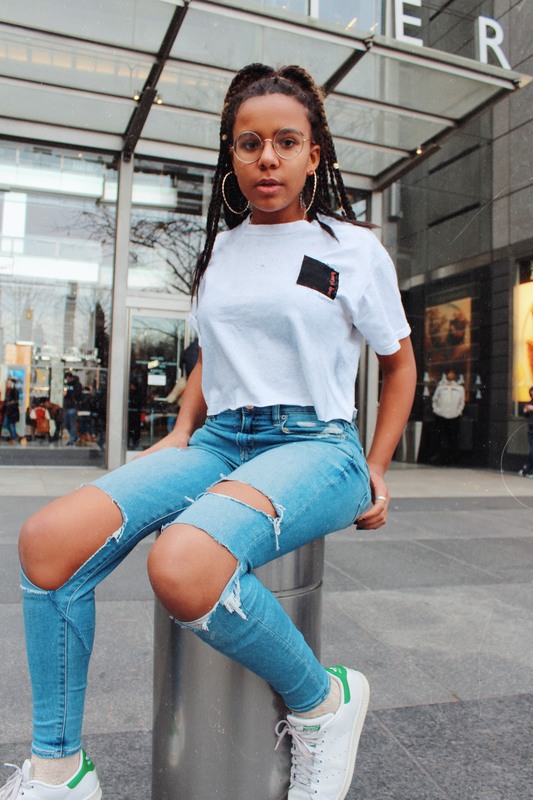 Pop culture today has begun to focus a tremendous amount on brand clothing, using fashion as a personal statement as well as an outlet for self expression: And simplicity is key. Sometimes a simple idea can become reality, the same way it did for Frank Sinatra School of the Arts (FSSA) juniors Nina Martin-Jenkins and Frankie Sierra. 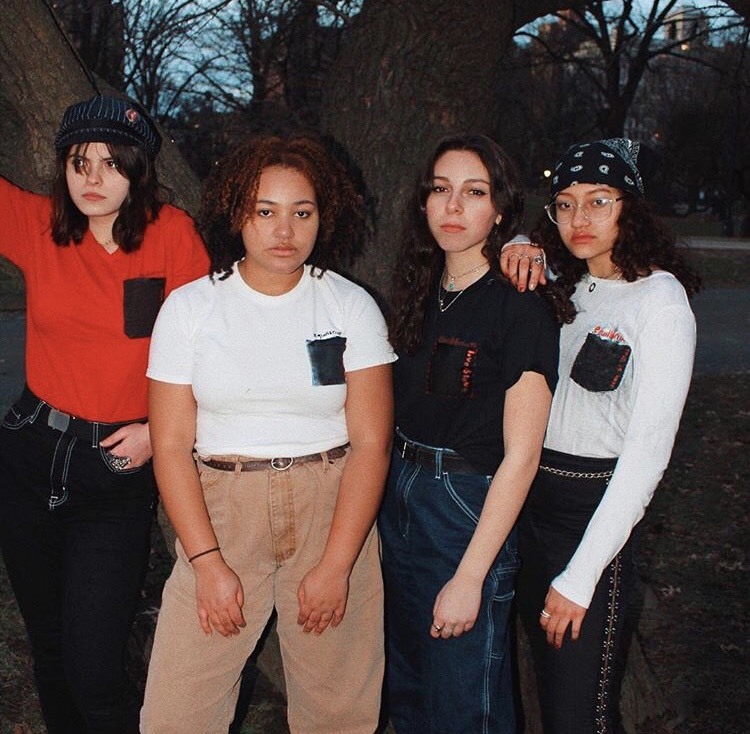 From picking a name for their new clothing brand to finding models and figuring out ways to promote their new line, these girls have more than just clothing to put together, they have art to create. Nina, a vocal major and Frankie, a drama major, have spent more than four months working on their new brand, Equillibrium. The project was born from an English class assignment taught by Ms. Stefanidis. In class, they were asked to create an idea for a business as it related to a writer that they were focusing on. 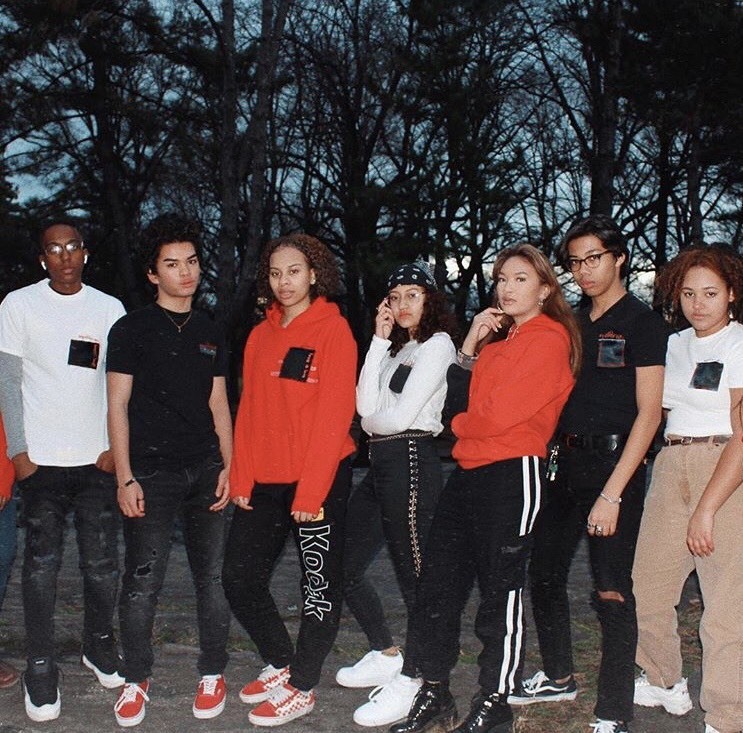 However, the idea of a new clothing line that Nina and Frankie came up with expanded outside of the classroom which is what led them to where they currently are now; creating art in the form of clothing for all. FSSA students wearing the Equillibrium brand. Photographed by Imani Fernandez, FSSA vocal major. The line did not drop until mid-January, although it had been in the works for a couple of months. However, although the line was dropped, clothing sales will not begin until the end of this month. Their first photoshoot was held in January in Manhattan, with models that felt comfortable enough to wear the clothing. The models include some close friends of both Nina and Frankie, who reached out when first hearing about the brand. This is one of the main promotional aspects of the line, and the photos will be dropping with the release of the brand very soon. “We are planning to promote through social media, as well as creating posters so that it can become the ‘talk of the town’ so that we can gain customers who are interested in the message our pieces have to offer,” explains Nina. One of their main promotions will be through instagram, on their page @exuillibrium.nyc, where they have already dropped some previews and sneak peaks of the models and the t-shirts they have created. This line will not only be something Nina and Frankie work on for a month or so and then forget about, as they’ve expressed that fashion has become a huge part of their lives especially throughout high school. Nina expects to pursue fashion in the future as well and the Equilibrium line is just the start. “I’ve always wanted to be an influencer or someone known within the industry,” Nina says. Like Nina, Frankie also imagines that the brand will be the start of something a lot bigger in the future. Their goal is to create clothes that are simple yet unique, as Nina says they’re going for a streetwear kind of style. “We do expect the brand to be moderately small and unknown for a little while, but we also do expect and hope that eventually it will blow up since we both want to be entrepreneurs, this is a venture that will get us going,” Frankie states. There is also a great meaning behind the brand, its name and what it stands for. Nina and Frankie showcase this through their models, as they want to promote all people of different shapes, sizes and colors. They have already planned out three lines that they will be dropping each with its own focus and significance. The first line will be a “love is love” statement for the LGBTQ community where they hope to raise enough money to donate to an LGBTQ foundation. Their idea for the next line will focus on “BLM” (Black Lives Matter), and their last movement will focus on body positivity. Each line will have its own style, along with different prints and colors. For the line, Nina and Frankie had friends willing to model the line, as these models were comfortable with the clothing and liked what it stood for. The models also play a great role in this process as it’s the way they perceive and wear the clothes that really matters. “After finding out about their new line I agreed to the photoshoot because the clothes were comfortable and all the models were friendly and they understood the meaning behind the clothing. The line is simple, yet so complex at the same time when considering the message behind it,” Yuli says. So far, Nina and Frankie have created t-shirts and sweatshirts for their first line, but they hope to expand on to more clothing items such as sweatpants and other gender neutral apparel. This line is more than just throwing together some fabrics and sewing logos on a shirt, it’s the beginning of something new; it’s going to be something big, sweet wearable art for all.